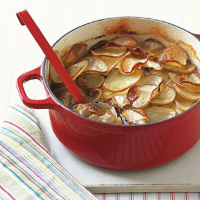 Long, slow cooking really brings out the flavour in this typically English hotpot. With its layers of celeriac and potato, it makes great comfort food. Preheat the oven to 150°C, gas mark 2. Trim any excess fat from the lamb and cut into chunky bite-sized pieces. Place the seasoned flour on a plate and use it to coat the lamb pieces. Heat 1 tablespoon of the oil in a large frying pan and fry the lamb in 2 batches for 2-3 minutes until lightly browned. Drain on kitchen paper then place in a 2-litre casserole dish. Add the onions to the pan with another tablespoon of oil and fry for about 2 minutes until beginning to soften. Spoon in the remaining oil, the mushrooms and the thyme sprigs and fry for 5 minutes or until the mushrooms begin to soften. Add to the lamb and pour in the stock. Layer the celeriac over the lamb, top with the potato slices and season. Put on the lid and cook for 1½ hours then remove the lid and cook for a further hour, or until the potato topping is crisp and golden. Leave to rest for 15 minutes before serving with Chantenay carrots and lightly-steamed tenderstem broccoli. If neck fillet is unavailable, try replacing it with cubed, trimmed lamb rump steaks. Browning meat is essential to give the gravy a rich colour and flavour. Try a soft, southern French red blend.